Please stay tuned for an update regarding our organization. 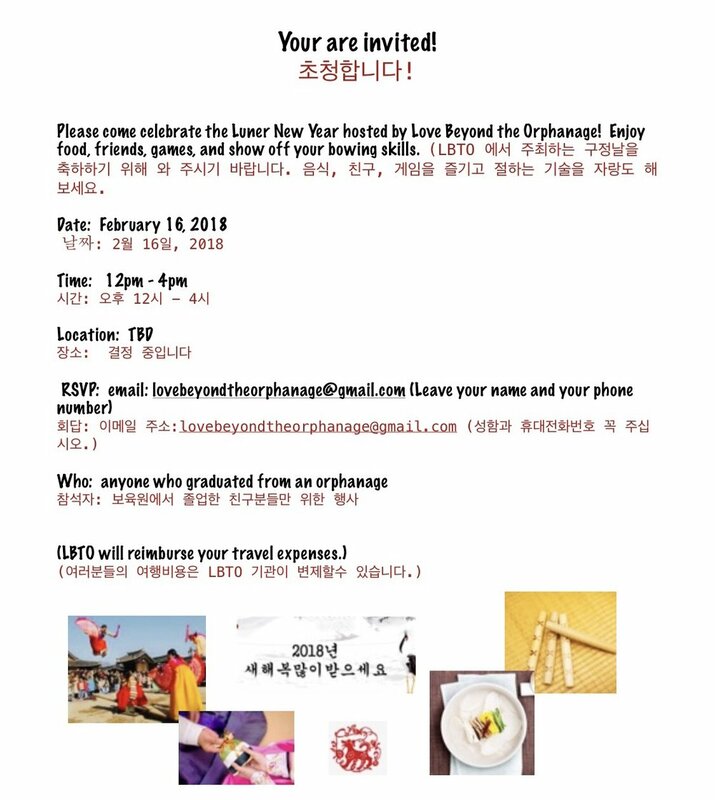 Love Beyond the Orphanage celebrated the Lunar New Year in Korea with 35 aged out adults! What a wonderful time of food, fun, and fellowship! Love Beyond the Orphanage was excited to host our first Chuseok Holiday party in Korea for individuals that are living independently. We shared our stories, helped prepare traditional Korean Chuseok meal, and spent time together as a family. We hoped we succeeded in creating a memorable event for everyone that was able to attend. 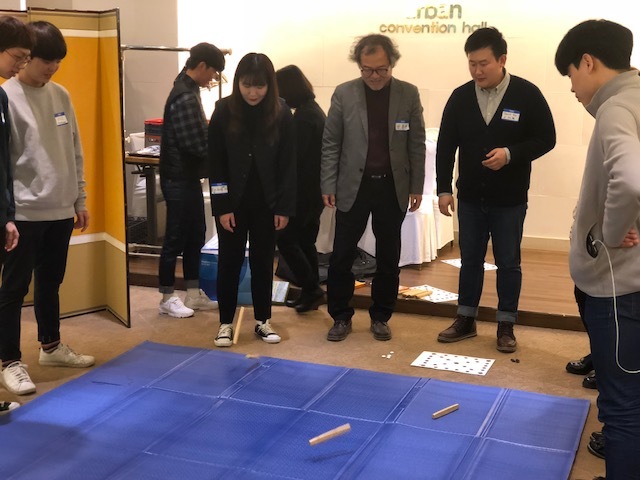 We had ten individuals from Incheon, Seoul, and Busan. "Honestly, I didn't expect much about Chuseok holiday. I just thought that they would ask me my daily life. However, my mind totally changed after the Chuseok event. We are little different than others. It's hard to live as an orphan. I hide myself to avoid from people's bias because It's not easy to meet somebody who listens to my story without bias. Therefore, sometimes I am lonely. That's why the event was really shining. I could talk about my daily life without hiding anything during preparing traditional Korean food. Also we really opened up our hearts sitting in circle. I really thank all the LBTO members for the event. Thank all of my friends for telling their story openly. Even though things won't get much better, I got much comfort that there is someone who supports me. By the time of the event almost ends, everyone felt affection and kinship. Even though we all have been through tough time, we also felt that we should go further instead of sitting down. I hope this kind of event will be held continuously. I very much thank all the people who made the event." 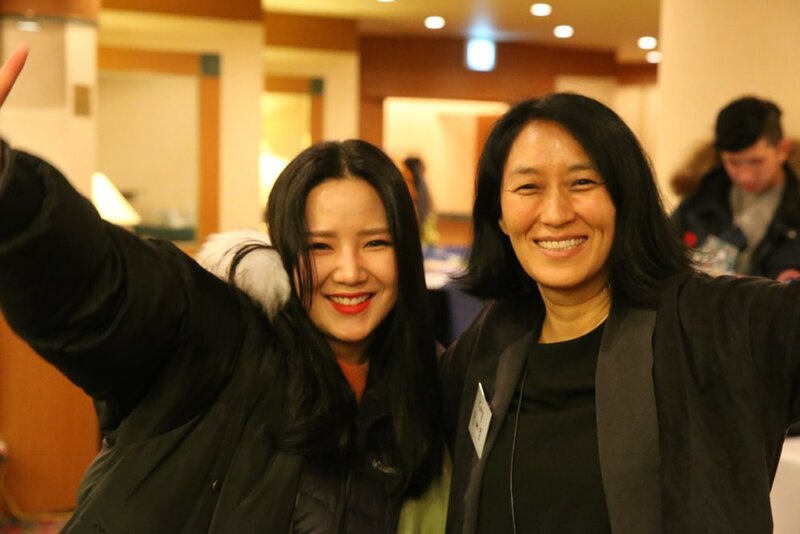 Love Beyond the Orphanage held two very successful events in Seoul and Busan. 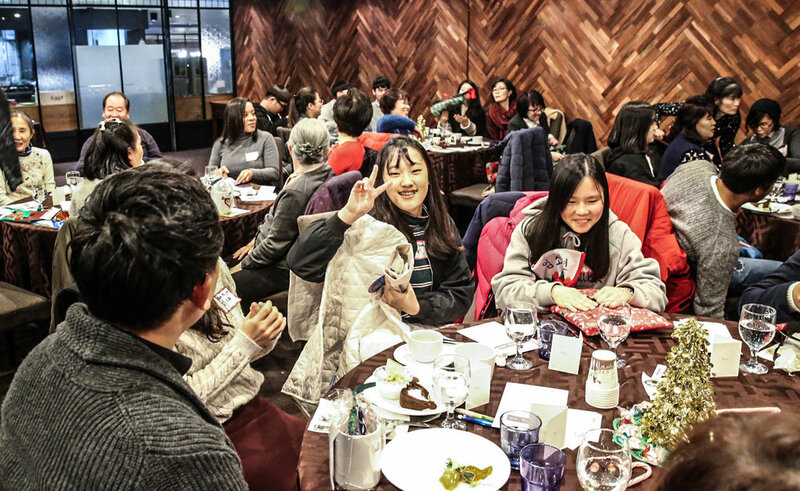 The party in Seoul consisted of high school students and a few that had already graduated from one orphanage. 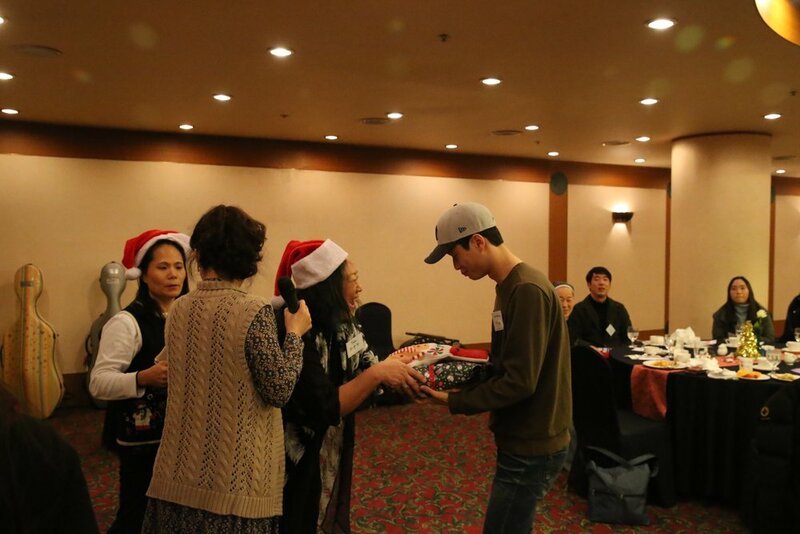 Also included were 20 adults that grew up with Julie in an orphanage in Korea and currently living in Korea. 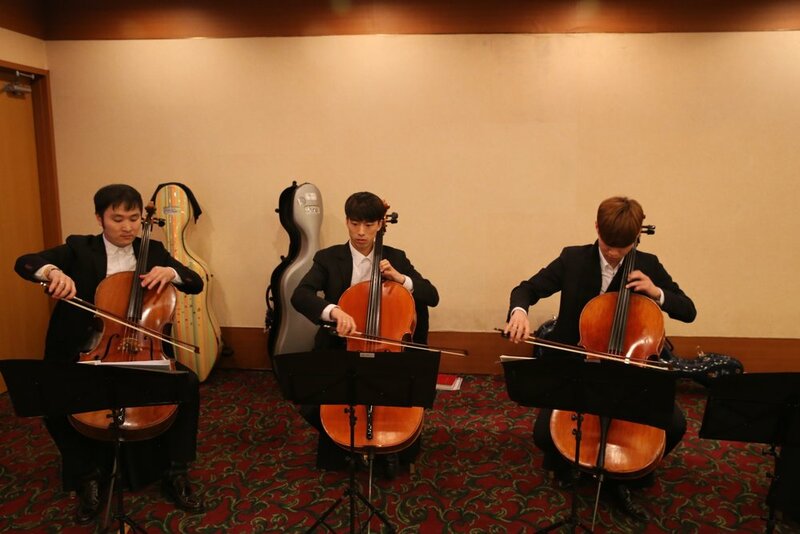 The party in Busan consisted of high school students, graduates, and adults from three different orphanages. Love Beyond the Orphanage 는 성공적으로 서울과 부산에서 행사를 열었습니다. 서울에서 열린 행사는 고등학생들과 이미 한 보육시설을 졸업한 몇몇 사람들이 함께하였습니다. 또한 줄리와 같은 시설에서 함께 자랐고 현재도 한국에 살고 있는 20 명의 자매들도 참여하였습니다. 부산에서 열린 파티는 세 군데의 다른 보육시설 고등학생들과 졸업생들, 성인들이 함께했습니다. We received very positive feedback from the guests and distinguished guests in attendance. It was heartwarming to hear the talk around the room about how nice the events were and how excited everyone was about being there. To know that they felt like we treated them with dignity and with love fulfilled our mission to show our guests that we wanted them to feel a part of a family during special Holiday times. We made it a point to treat them as the guests of honor and to see and hear the excitement in the room was like being at a family party. In February, the board will be holding a meeting to assess the needs of the adults and determine how our organization can be of service to their success. We will update and post our next action plans after the board meeting. 2 월중에, 이사회에서는 성인고아들의 필요한 부분을 검토, 평가하고 그들의 성공을 위해 우리 단체가 어떻게 섬길 것인지 결정할 것 입니다. 이사회 모임 후에 다음의 계획을 공지하고 업데이트 하겠습니다. We want to thank all of our donors, for without you, our events would not have been as successful or probable. We thoroughly appreciate the trust you have instilled in us to fulfill our mission. Your generosity and support means everything to us as we continue to help adults in need. We also want to thank our many volunteers that helped with getting everything organized and executed. We appreciate those that volunteer their time as we focus our monetary donations to the adults that are seeking our help. 모든 후원자들께 감사드립니다. 여러분이 없었다면 우리의 행사는 성공할 수도 없었으며, 가능할 수도 없었을 것 입니다. 여러분께서 우리의 목표를 달성하도록 계속 신뢰하여 주셔서 매우 감사드립니다. 여러분의 넓은 마음과 지원은 우리가 계속해서 도움이 필요한 성인고아들을 도울 수 있는 모든 의미가 됩니다. 또 모든것을 준비하고 진행을 도와준 많은 자원봉사자분들에게도 감사드리고 싶습니다. 우리의 도움을 찾는 성인고아들에게 물질적인 후원이 집중될 수 있도록 시간을 내어 봉사해주신 분들께도 감사드립니다. "At both parties, I had the sense that more than the gifts the individuals received...they appreciated knowing that others (outside their orphanage) acted about them and were ready to help." "두 파티 모두에서 개개인 한 사람 한 사람이 선물이상의 것을 받았음을 느꼈습니다. 그들은 (보육시설 밖의)사람들이 그들에 대해서 무언가하고 도울 준비를 하고 있다는 것을 알게 된 것에 감사하였습니다.
" ...at least the other orphanages got to know that there were other adult orphans. After, having time to mix and talk to the adult orphans, you could learn more about them." 적어도 다른 고아원들에서는 다른 성인 고아들이 있다는 것을 알게 되었습니다. 나중에 함께 섞여서 다른성인 고아들과 이야기 할 시간을 가진다면 여러분들은 그들에 대해 더 알게 되실 것 입니다. 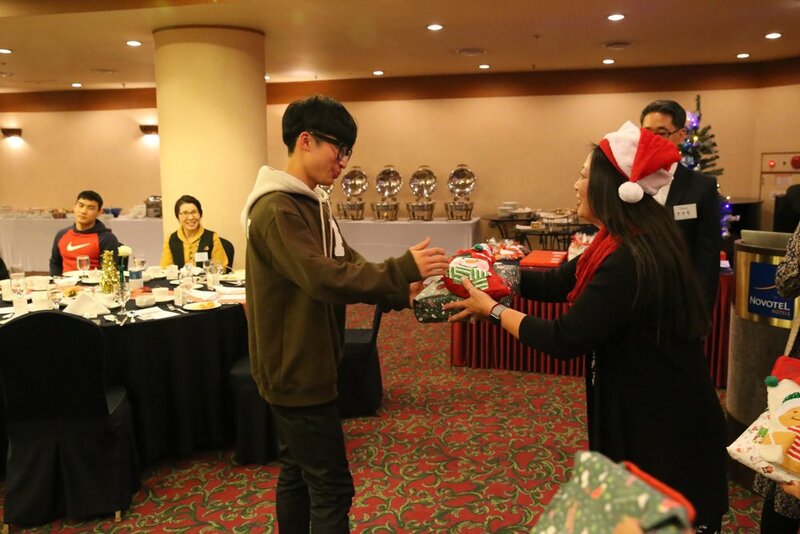 "Then we presented the gifts and stockings to each participant. There was great excitement and joy which filled the room. The message of hope, love and genuine caring was key to our success, and we felt like we delivered just that." "We received very positive feedback that the event filled participants with hope, love and a sense of being validated." 우리가 선물과 크리스마스 양말을 각 참가자들에게 보여주었던 순간, 그 공간을 가득 채운 엄청난 환희와기쁨이 있었습니다. 희망, 사랑과 진정한 보살핌의 메시지가 우리의 성공의 열쇠였고, 우리는 바로 그것을 전달했다고 느꼈습니다. "I was so happy to see the bright happy faces of the teens. They seemed to be so appreciative of the effort that we put into the event. I know they loved their stockings and gifts." "I felt from those I spoke to and the general feeling that the kids were very happy to be there and so grateful for their stockings and gifts. Many seemed to be excited that we were there to offer help and guidance. I was overwhelmed with emotion when I got home and started recounting the experience to my family and friends." "저는 청소년들의 행복하고 밝은 얼굴을 보아서 행복했습니다. 그들은 우리가 행사에 쏟은 노력에 감사해하는 것 같았습니다. 또 크리스마스 양말과 선물을 너무 좋아했습니다." "저는 제가 말했던 사람들로부터 전반적으로 아이들이 거기에 있는 것을 행복해 하고 크리스마스 양말과 선물에 매우 고마워한다고 느꼈습니다. 많은 사람들이 우리가 거기서 도움을 주고 인도하는 것에 즐거워하는것 같았습니다. 저는 집에 도착했을 때 감정이 북받쳐 올라서 가족과 친구들에게 그 경험을 이야기 했습니다. We would like to thank our donors for their generous support! The events were very successful and the students and adult orphans truly enjoyed the celebration of Christmas! 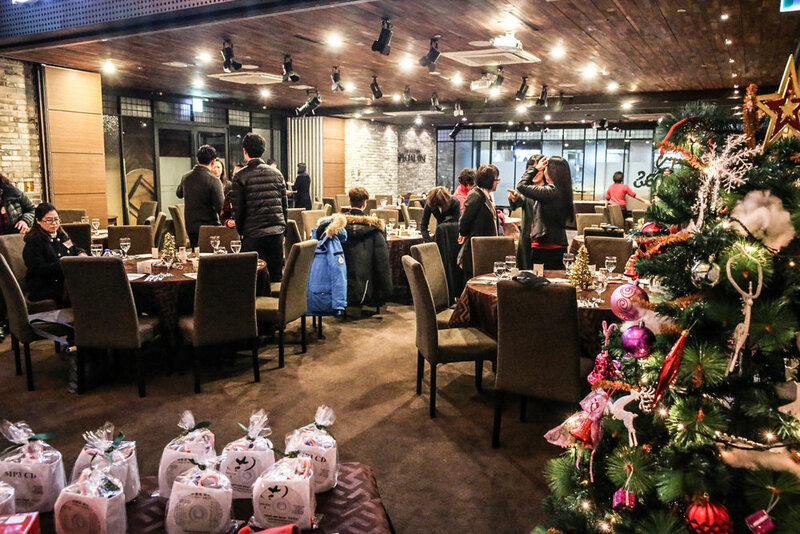 Share The Joy of Christmas 크리스마스의 기쁨을 나눕니다. December is two months away. The Christmas Holiday and those like it are very big celebrations for families and friends. 12월은 아직 두 달이 남았습니다. 크리스마스와 연말은 가족과 친구들에게 매우 중요한 기념행사입니다. 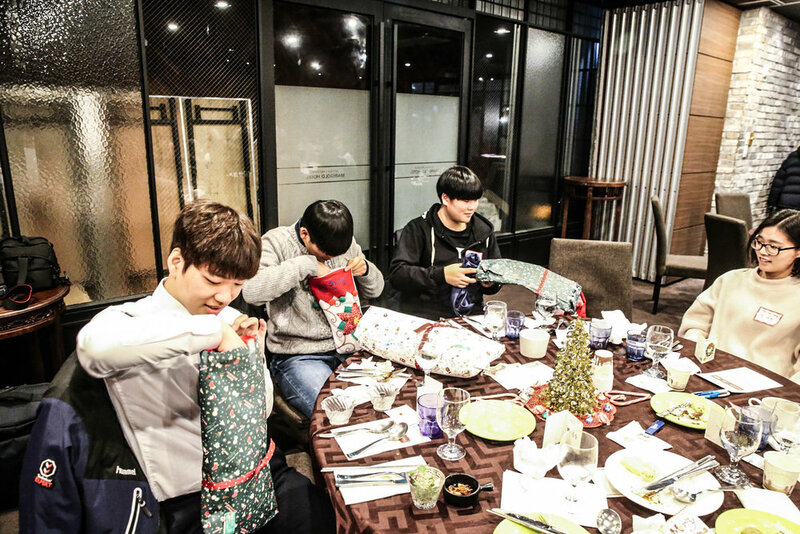 The sad reality is that adult orphans in Korea feel lonely and isolated during these times. For us in the US, the holidays are a time for reflection on the blessings of our friends, families, and co-workers, and the sharing of festivities with our loved ones. We are showered with gifts, food, and activities which remind us that we belong. For too many orphans, holidays hold no special meaning. In fact, it served to remind them that they don't belong. They have no family. Their difficult financial circumstances prevent them from any indulgences. They lack any sense of celebration. This was Julie's world for too many years, especially when she was a young adult in Korea. The Board of Directors of Love Beyond the Orphanage, prepare to travel to Korea to host Christmas parties for young and adult orphans. Our goal is simple. We want to deliver a message of hope, share the joy of Christmas and tell them that they are loved. 슬픈 현실은, 한국의 성인 고아들은 이 기간 동안 외로움을 느끼고 사회로부터 고립되어 있다는 것입니다. 미국에 있는 우리들에게 크리스마스 연휴(한국의 설 명절과 같은 기간)는 지난날 동안 친구들과 가족들, 직장동료로부터 받은 고마운 일들을 되돌아보고 사랑하는 사람들과 축제를 나누는 시간입니다. 우리는 우리가 속한 곳을 기억할 수 있는 선물을 주고받고 음식을 나누며 활동을 합니다. 그러나 많은 고아들에게 크리스마스 연휴(명절)란 별다른 의미가 없습니다. 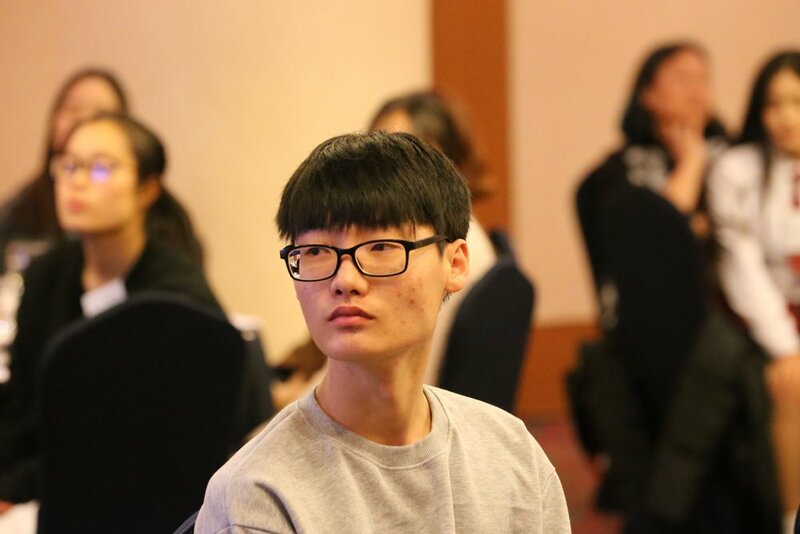 솔직히 명절은 이 아이들에게 자신이 어느 곳에도 속해있지 않다는 것을 다시 한 번 상기시키는 기간입니다. 가족은 없고, 경제적인 어려움으로 인하여 하고 싶은 일들이 있어도 마음껏 즐길 수 없습니다. 이 아이들은 기념하고 축하하는 감정이 부족합니다. 이것은 줄리가 오랫동안, 특히 한국에서 성인 고아로 있었을 때 경험한 세상입니다. ‘러브 비욘드 디 올퍼니지’의 이사회 임원들이 젊은 그리고 성인 고아들을 위한 크리스마스 파티를 열기 위해 한국 방문을 준비하고 있습니다. 저희의 목표는 간단합니다. 희망의 메시지를 전달하고, 크리스마스의 기쁨을 함께 나누며, 누군가 이들을 사랑하고 있다는 말, 당신은 사랑받고 있다는 말을 전하기 원합니다. Please support our important work with your donations and your prayers. As always, all funds donated go directly to help those we serve. We thank all of you for your kind hearts in lifting the spirits of teen and adult orphans. 저희의 중요한 임무를 위하여 후원과 기도로 협력해주시기 바랍니다. 항상 그렇듯이, 모든 후원금은 우리가 섬기는 곳을 돕기 위하여 전적으로 쓰입니다. 십대와 성인 고아들에게 힘을 불어 넣어 주시는 모든 여러분의 친절함과 정성어린 마음에 감사를 드립니다. All our board members and volunteers pay for their own travel and expenses. 우리 단체의 모든 이사회 임원들과 자원봉사자들의 여행경비는 개인이 스스로 부담합니다. Love Beyond the Orphanage Gives Thanks to David Ko and Pastor Kim 고대현씨와 김인태 목사에게 감사를 드립니다. On behalf of Co-Founders, Julie and Kimberly and the Board of Directors for Love Beyond the Orphanage, we would like to extend our sincerest and most grateful Thank You to Mr. David Ko and Pastor Kim for their tireless work into translating our website for us. Without their faithful time and energy put into translating, we would not have been able to accomplish this without them. We are forever grateful for their continued faith in our organization and we feel blessed to call them our friends in God's work. 공동설립자 줄리와 킴벌리 그리고 ‘러브 비욘드 디 올퍼니지’의 이사회 임원들을 대표하여 우리의 웹사이트 번역을 위해 부단한 노력을 해주신 고대현씨와 김인태 목사님께 진심어린 감사를 표합니다. 번역을 위해 이들이 쏟은 시간과 에너지가 없었더라면 이 일을 완수해 내지 못했을 것입니다. 우리 단체를 향한 그들의 지속적인 신뢰에 항상 감사드리며 또한 이들을 우리의 친구로 인도해주신 하나님의 일을 통해 축복을 느낍니다. My return home from Korea used to be an ordinary event... anticipating my normal routine and seeing my family. This time, I am returning with so much homework regarding how to assist aged out orphans and plans for action. 한국에서 집으로 향하며 일상으로 돌아가서 가족을 만날 것을 예상하는 것은 일상적인 일처럼 익숙했다. 이번에는 성인 고아들을 도울 방법과 실행 계획에 관해서 많은 숙제들을 가지고 돌아간다. What we observed during our stay in Korea was encouraging and hopeful, but also, heartbreaking. Yes, the Korean government has done a great job of providing orphans a safe and secure place. Their circumstances have improved compared to just a few years back. I was most impressed and so relieved to learn that physical and psychological abuse against orphans is forbidden. 우리가 한국에 머무는 동안 우리가 발견한 것은 힘이 나고 희망적인 것도 있었지만 가슴이 아프기도 했다. 그렇다. 한국 정부는 고아들을 안전하고 잘 돌보고 있었다. 성인 고아들의 형편은 불과 몇 년 전과 비교해서 많이 개선되었다. 제일 인상적이고 안심이 되었던 것은 고아들을 물리적, 정신적으로 학대하는 것이 금지되었다는 것이다. Now, everything is controlled by the government. Orphans are no longer subject to malnourishment, but honestly, they are still malnourished psychologically, emotionally and spiritually. The government cannot replace a family with an institution. In the orphanages we visited, the children are labeled as non adoptable. With the change of adoption law in 2012, we saw children and young teens who are so precious but given absolutely no chance of having thier own family. Their institutional upbringing will severely hamper their chance for a positive future. It will manifest itself by creating lack of self esteem, lack of motivation, lack of mental stimulation, and lack of hope. It will create a barrier in their ability to relate to those outside the institution! These qualities must be instilled from a young age. 현재, 모든 것은 정부의 통제 하에 있다. 고아들은 더 이상 영양실조에 걸리지 않지만 솔직히 말해서 고아들은 아직도 정신적으로, 감정적으로, 영적으로 굶주림 당하고 있다. 정부가 보육시설로 가족을 대신할 수는 없다. 우리가 방문했던 보육원에서 아이들은 입양이 안 된다고 분류되었다. 2012년에 바뀐 입양 특례법으로 인해 그들의 가족을 가질 수 있는 기회조차 완전히 얻지 못하게 된, 너무 소중한 아이들과 청소년들을 보았다. 보육시설에서 자라나는 것은 분명히 아이들의 긍정적인 미래에 방해가 될 것이다. 그리고 자존감 결여, 동기부여의 결여, 정신적(정서적) 자극 부족, 희망 결여 같은 것들이 들어나도록 만들 것이다. 보육시설 밖에 있는 사람들과 교류하는 능력에도 장벽이 만들어 질 것이다! 이러한 문제들이 어릴 때부터 서서히 스며들게 될 것이 분명하다. These were common concerns among orphanage directors. Consequently, when these young teens are ready to leave the institution, the only "home" they know, many suffer from the inability to adjust into society. Most opt to work in a low skill jobs. When the government stipend runs out after the age of 21, the harsh reality hits them, and most don't seek help. Although the government and some orphanages are recognizing that the greatest need is providing education in independent life skills, this does not aid those who are past 21 years of age. Where can they go when they desperately need help? The Love Beyond the Orphanage is aimed at helping them, to encourage them not to give up hope. We have so much work to do. We have seen God's intention by His proving us with wonderful volunteers, directors and friends who share our vision and goals. 이런 것들은 보육원장들 사이에서 흔한 걱정거리이다. 그 결과, 집이라고는 시설 밖에 모르던 이 젊은 십대들이 시설에서 나가게 되었을 때, 많은 숫자가 사회에서 적응하는데 실패함으로 고통 받는다. 대다수가 단순직을 선택한다. 21살 이후 정부 지원금을 다 쓰고 나면, 가혹한 현실이 닥치게 되는데 대부분 도움을 구하지 못한다. 정부와 몇몇 보육원에서 그들이 가장 큰 필요한 것이 자립을 하도록 살아가는 기술과 방법을 알려주는 교육을 제공하는 것임을 인식하고 있지만, 21살이 지난 아이들은 돕지는 않는다. 그들은 절실히 도움이 필요할 때 어디로 갈 수 있을까? Love Beyond the Orphanage는 바로 그들이 희망을 잃지 않도록 돕는데 목표를 두고 있다. 우리는 할 일이 너무 많다. 우리는 우리의 비전과 목표를 나눌 수 있는 훌륭한 자원봉사자, 보육원 시설장과 친구들을 만나게 해주신 하나님의 뜻을 보았다. So, I am returning home with hope that we can work hard to make resources available for those who are soon to age out and those who have already aged out. We must communicate to them through our words and action that they are not a forgotten people. Thank you all for your prayers, support and encouragement in this endeavor. 그래서, 곧 보육원을 나가게 되고 이미 나가있는 고아들에게 도움이 되는 자원을 만들기 위해 열심히 일해야겠다는 희망을 갖고 집으로 돌아간다. 이 아이들이 잊혀진 사람들이 아니라는 것을 알려주기 위하여 우리의 말과 행동을 통해 그들과 소통해야만 한다. 여러분들의 기도와 후원 그리고 이 노력을 격려해주심에 감사합니다. 성인 고아들의 필요를 조사하는 한국으로의 여행: 우리는 성인 고아들에게 물어볼 질문들이 필요합니다. lovebeyondtheorphanage@gmail.com 으로 메일을 보내주세요. Julie, Kim and Katy are traveling to Korea soon and will be visiting and handing out a questionnaire to Adult Orphans in order to gather information on their greatest needs. If you have any questions that we should ask them, please email us. We will post an update at the end of July. We will be paying for our own travel. No donation money will be applied to the trip. 줄리와 킴, 케이티가 곧 한국을 여행하며 성인고아들을 방문하여 그들이 가장 큰 필요 것이 무엇인지 정보를 모으기 위해 설문지를 나누어 주려 합니다. 우리가 물어봤으면 하는 질문들이 있다면, 메일을 보내주세요. 7월 말에 소식을 업데이트 하겠습니다. 여행비용은 저희 각자가 개인 부담하며, 후원금은 이번 여행에 쓰이지 않습니다. Proseeds is a quick and easy way to donate to Love Beyond the Orphanage! 프로시드는 Love Beyond the Orphanage에 기부하는 빠르고 쉬운 방법입니다!